How do you decide where to take risks, and how often do you measure your successes and failures by them? In this episode, Kent and Kevin discuss how continually improving and looking towards the next thing can be really exciting, but also really risky! Listen to find out how behind the scenes decisions are made here at Memphis Invest, and how Kent and the team decide what's best for the future of the company. Since the beginning of Memphis Invest, a lot of growth and opportunities have come along, and it takes plenty of preparation and due diligence to know when to 'say yes' and when to move on. In the past, and in an effort to get the ball rolling, Kent used to make many decisions very quickly and would definitely recommend that no one do that now. After a lot more experience, he's learned to take a slower approach, ask more questions, and surround himself with better people and information. Now when deciding on next steps for the business, there's much more listening, approaching things from different angles and making sure the opportunity is worth the risk for him and for our clients. Once you've surrounded yourself with experienced people and different points of view, its much easier to measure your level of risk and make better decisions as an entrepreneur. 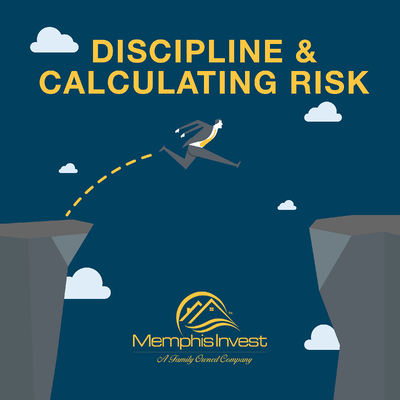 One of the calculated risks that Kent discusses in this podcast was the desire to bring another revenue stream to Memphis Invest, while also providing an excellent service to our clients. After doing some research and talking to a lot of people with experience in the industry, we were able to create our proprietary insurance program, Willis Insurance. Due to the amount of coverage, the significant cost savings, and ability to keep all the maintenance of the program in-house, Kent felt like this was a natural fit for the company. Having never provided this type of service before to clients meant that the company was taking a risk, but it has proven to be a huge asset to our investors, and a continued revenue stream for the business. But while we have had successes, there have been plenty of failures, one of which started over a year and a half ago. Since Memphis Invest has had so much success renovating properties for investors, we thought it would only be a step in the right direction to renovate houses for sale to the general public. Happening mostly in Texas, we had our teams buy, renovate, and sell owner occupied properties for the first time back in 2016. After 1.5 years, Memphis Invest came to the conclusion that it is not the best fit for our business model. And after calculating the time, man power and money used to try out this new venture, we can say that we tried, took a risk, broke even, and we learned a lot. Bottom Line: With every decision you make as a business owner and entrepreneur, you're always taking some type of risk. Be sure to surround yourself with as much experience as possible, ask the right questions, and be disciplined enough to know when to try new things and when to move on. Kent Clothier: Hello everybody, again, this is Kent Clothier Senior on the Experience Matters Podcast, your host today. Co-hosted by Kevin Hommel who'll join us in just a second. Producer just told me that this is episode number 31 today and we're going to be talking today about discipline and calculating risk as an entrepreneur and business owner. So we're going to get in to that in just a couple of minutes. I wanted to thank you for joining us today, you can find us at memphisinvest.com on both audio and video. Also iTunes, Stitcher and SoundCloud and where we're available with 30 podcasts for your enjoyment to listen to. Hopefully you'll drop us a comment, send us an email if something you like is discussed and again, it's our pleasure to bring you the content. Hopefully you take an idea or two from any of the sessions and we've been of some kind of assistance or help with you, some ideas and some thoughts and some content that maybe it'll apply in your business and in your journey. So with that said, let me introduce Kevin. Welcome, Kevin. Kevin Hommel: Hey, thanks for having me back. Kent Clothier: Thank you, sir, whenever you're ready to jump in here and kind of lead us down this path this morning or this afternoon. Kevin Hommel: Happy to. So, I'm always glad when you want me to pick the topic. I try to go back and look at what we've hit on and try to stay on theme. The last couple episodes that we've done have talked about the risk of starting your real estate business or becoming an investor, but then before that we've also talked about the risk of being an entrepreneur. So, today I thought a good one would be to speak to the entrepreneur who is, I'm going to say, a lot like you. You always have ideas, you always have things coming out, you're always thinking about what's out there, what's next, how to continually improve. And I think part of that for you, that you sort of instill throughout our company is how to always see other opportunities for revenue streams and businesses that kind of go alongside of what we do best, which is buying, renovating, selling and managing property and giving a client experience. A lot of opportunities have come your way, come our way, in the history of the company and you've had disciplines to say no to some, you've had the desire and the willing to take the risk to say yes to some so I thought we'd just get in to that a little bit and hopefully the entrepreneur out there listening can take something away from that. Kent Clothier: Well as you and I were talking about earlier, there's, again, the revenue streams at any business, each one of the revenue steams could be some kind of risk, some kind of calculated risk. And again, as we talked earlier, we have to know when to say yes and when to say no and you have to have the discipline and know how to calculate the risk that you're taking and the level of risk that you want to take in any endeavor that you get in to as an entrepreneur. So it takes time to do your due diligence and I guess the thing that I've learned over the years, I used to make a lot of quick decisions on things and I would listen to people and immediately make a decision and some times that was good, some times it's bad. Probably more times under that scenario it's bad than it is good. And then as I've gotten older and more business experience, more life experience and better people around me that I ask a lot of questions and I listen to people then I try to make an educated decision based on the risk, based on the opportunity, based on the possible revenue stream or whatever the case may be. But it all comes back to me on when you get in to any kind of risky situation, that you've done your due diligence, you've done your homework, you've asked the right questions, you've listened to the right people, you've gathered enough information and enough content to make a decision based on a lot of people's input, other people's experience and then it comes down to you. And again, all we're trying to do with all of that is minimize the risk. Kevin Hommel: So I'll tee up one that's worked really well for us and we can kind of talk through the dynamics around that one and maybe we get to the end and we can look at one that maybe didn't work out well for us. Let's go to the insurance program that we've designed, because your vision behind that was one, we can take advantage of our size and the fact that we manage 45, 4600 properties and go to an insurance company out there, build a policy for clients and that actually is a revenue stream for Premiere but there's also a bigger why behind it. It was the right kind of coverage for an investor. How did that idea come to you? And maybe we'll kind of dialogue back and forth on how we put that in to practice. Kent Clothier: Well, to me, we had an opportunity and I think this came in to play at about 3000, 3500 properties that we had enough leverage there that we could sit down with an insurance company, more than one, and talk about what we could bring to the table for our owners, and that we could bring all these properties and owners to the table for being able to leverage the number of properties in all the cities for a better policy, a better rate, a better situation for our owners which in the end, does nothing but increase their risk, excuse me, increase their return. And that was the big play there if we could do that. To your credit, you went out and found a number of insurance companies for us to choose from and then today we keep looking at other ones and renews once a year and we bring different people in and get pricing and today we have, literally, thousands and thousands of properties on our insurance program that we do. It's become a new revenue stream, but again, it's something that we have to continue to monitor, continue to police. We can't just assume that it's going to be car [inaudible 00:06:36] every single year on it. It takes a lot of work and a lot of due diligence. Even today, there's still a lot of opportunity for us to get additional owners and additional properties that we have on that. And then, even outside of our company with this particular type of insurance for our owners, or maybe even other opportunities for us with other outside companies or outside properties. Kevin Hommel: So we bring in a fee to offer that service to the clients and we handle everything for them, so that's an easy justification of that. We did have to add some staff to handle the volume that that creates so there is some cost to us but the bigger part of that, I think for you, was it was the right kind of product for the client. And if it wasn't that, then the revenue stream ultimately wouldn't happen. I think that's ... For a lot of entrepreneurs out there, that revenue stream starts coming in and they get addicted to that but they stop looking at the fact that well it's still got to be good for the client and it's still got to provide the right coverage and it does have to mitigate a lot of that risk that they might take being a real estate owner. Kent Clothier: Well nothing mattered in the end unless it saved money for our investors and was a good deal for them. And then, it ended up being a revenue stream for us for processing and handling renewals and some administrative costs that come with each one of the properties. But in the end, it still saved our owners money and it still saves them money today in the insurance arena about what they could get and what we can get. In most cases it does save them money. It ended up being a new revenue stream and will continue to be good for us as we move towards 5000, 6000 properties. Kevin Hommel: And as you said, it helps their bottom line on the properties because it saves them the money which is obviously better for their experience overall as well. That's one that's worked out really well, and again, the message there to the entrepreneur is it's not just the revenue, it's actually got to fit in to the culture of what we do which is provide a great experience and help investors be successful. Kent Clothier: And it saves them a lot of time, saves our investors a lot of time. We have investors average three, four, five, six properties. Some have a lot more properties than that. Instead of them, once a year, having to go out and shop, they certainly can if they want to, but we do that service for them and hopefully every single year we continue saving them money. Kevin Hommel: Yeah, so again, that comes alongside our operation and fits really well with what we do to serve our clients. That's got to be a part of it. You look in the news, the Southwest stuff ... Just the stuff that they do that gives Southwest their name, doesn't excuse them from ... They still have to continue to do quality things. In the news today, there's another issue with a cracked window and so they're going to have a hard time in the media for that for a while and that's probably going to hurt their company. I thought that would be an interesting ... Just the timing of that happening on top of this podcast was ... They're known for their customer service but that doesn't give them the ability to not be safe. Kent Clothier: No, they have to [crosstalk 00:09:44]. Again, not knowing the cause of the two recent things, as in any business, you never know when you'll have a situation that is not pleasant. Right or wrong, and whoever's fault it was or not, whether it's a manufacturer of their fault, their name's on the building, on the side of the plane, on the side of the car, whatever. Hopefully companies are strong enough to work through things like that. Kevin Hommel: Yeah, I wouldn't want to be the Chairman of Southwest [inaudible 00:10:17]. Kevin Hommel: So let's take one for us, maybe, that didn't work out as well as you'd hoped and planned. What comes to your mind on something we've tried to do that just didn't pan out? Kent Clothier: I don't have anything. Kevin Hommel: We've been great at everything! He's lying, folks. Kent Clothier: No. Shoot, over the years there's probably a lot of different things that our company here I guess we could go back to just in the last 18 months, we took a big risk with owner occupied properties, where we were going to go out and buy, and we did go out and buy, hundreds of owner occupied properties, mostly in Texas. We realized, after about a year and a half, it's not what we do best. I think in the end, when we looked at the whole big picture of this, we probably broke even on the whole deal, put millions and millions of dollars in to it but it's just not what we do. It's not what we do best. Now, had that been the only thing that we do and we weren't in the other side of the business serving investors, the story might've been different. But, we weren't afraid to get out there and try it. We threw a lot of money at it, we threw a lot of labor at it, we threw a lot of time at it and when you take a look at that after a year, probably been a year and a half at this point, as we exit that strategy we probably learned a lot. It's probably something that, today, we probably wouldn't do again. A lot of people out there are very successful at it but it just wasn't something that fit in to the base of what we do. But we tried it and again, some times you take risks that don't always produce big, big winning numbers for you. And that one certainly didn't. Kevin Hommel: There's definitely a couple of lessons there for an entrepreneur who's out there listening. One, for terminology's purposes, those are houses that we bought that we were not intending to sell to an investor for management, for long term hold, those were ones that we felt like were in a price point where we could put them on the retail market and sell them, just like we would sell our own houses out there in the retail market. So, just to define that. But you said one thing there that was interesting, because I was thinking about it a different way. You said if that was the only thing we did, we might have been successful at it. My thought was, I'm glad that's not the only thing we do because we had the financial strength to try something and it didn't work out and it didn't blow up the company either. So, I think there's a lesson in that. For the timing of a risk, you have to be able to sustain because there is going to be the possible downside, and in those, I mean we didn't lose money but it wasn't as profitable as our regular business. It probably did stretch our team a little bit to do that. The time invested in that as opposed to what we do best. That's the one I was going to pick if you didn't go there, so I'm glad you did first, but I feel like that's a great example for how you can still take risks. Maybe it doesn't pan out the way you want it to but it also didn't bury the company. Kent Clothier: Which one did you have? Kent Clothier: There's a lot of revenue streams in the real estate industry and whether we want to ... And we have our own real estate company, whether we wanted to do listings and sit out there with open houses every Sunday, that's another part of our business that we could do. Whether we wanted to get in to education and the coaching side of it, stuff that we dabbled in, but here's 31 podcasts right here that've got a lot of information and content on it for somebody. So let's take the time to listen to these 20-30 minute podcasts. There might be, what would that be Kevin? That'd be 20 something hours, maybe ... Yeah, maybe 20 something hours worth of content here. Hopefully some of it will be good. Yeah, there's some things out there in all industries, in all businesses, that you're not going to know until you try. Again, there was a big risk back when we started although we started with very little money and today it's 100 million dollar company with 90 employees in five cities and four, five office buildings, whatever we have, and still growing and still scaling. You've got to be willing to take the risk. You've got to be willing to try new things and all you need is more of them to be successful than not and you'll be in good shape. Kent Clothier: No, but I know you have something. Kent Clothier: Well we've always ... in the last three or four years we've been predominantly in the Dallas and Memphis market with a few homes in Houston. We're up to around 200 down there. But 1200 in Dallas, 3000 I think some odd here. So we had been talking about Little Rock and Oklahoma City for the past year, and I think just in the last six months that we've gone in to those, I was a little slow on pulling the trigger on it. I just wanted to be taking more calculated approach to it and get our team a little bit more seasoned on understanding exactly how we were going to do a market. I wanted to be able to, which we did in the last six, eight months, be able to do remote closings on the rental side without having to put a bunch of boots on the ground in Little Rock and Oklahoma City although we do have people in both markets now. But I wanted to see if technology would lead us to new cities and not have to spend as much money, not have to have bricks and mortar and not have to have a lot of agents on the ground there to rent our houses. Our team has figured out, through technology, on how, so far, to be able to rent houses in both of those cities which leads us to look at other cities like St, Louis, like Tulsa, like Austin, that we're considering. Like San Antonio, we're considering because now, with technology, we've figured out how to do this. But I was slow on this with [Martine 00:17:27], I was probably a year behind what Chris and Brent and Kevin wanted to do because again, there were some reasons in my mind. I just wanted to be slow. We had done Houston, we had three people hired in Houston, had an office down there, a lot of overhead. Today we have one person in Houston. Maybe you need another person shortly, we've figured out a way to eliminate our office down there other than just a small little executive space and try to minimize the risk and maximize the return and that should be in any entrepreneur's mindset as he steps out and takes any kind of risk. Again, how you could measure and calculate that to minimize the downside. Kevin Hommel: Yeah, so that was one, a risk you'll willing to take but a lot more conversation around that one because of the potential impact of new markets. And like you said, the main focus was on how can we do this without having to put boots on the ground but still provide the same product to our clients. We've now done that, and so Little Rock and Oklahoma City are still new but we're confident in what we've got going there now to talk about new ones. It reminds me of the quote, and we've probably talked about this on the podcast before, Truett Cathy, who's the founder of Chick-fil-A, says, "If you get better, your clients will demand you get bigger." And that's really the expansion came out of necessity from our clients that, "We want your product." And we've talked about it before, there's more people wanting to invest with us in real estate than we have houses to provide. Kent Clothier: And we needed other cities and that's where we're at and that's, again, for us to get to ... And we've talked about getting to 10,000 houses that we manage. We're almost at 5000 today, so that's going to take anywhere from 800 to a thousand a year for us to get there in the next five or six years. So, we're going to have to step out of our comfort zone a little bit, take a little bit more risk, hopefully it's very calculated and the returns are good for all of our people, all of our investors, all of our vendors and certainly our residents in those cities as we come in to those markets and start doing what we do, which is to really do excellent in every market and eventually dominate that market. Kevin Hommel: Yeah, and so this just comes back to one of our core values which is deliver, wow, experience in everything that we do. So, there's a lot of conversation. If you're out there and you're the main decision maker in your business, a lot of conversation around these do's and don'ts for us comes down to the same cheeseburger in each of our markets, for the client, the same house, the same experience for the client, the resident, the vendors and the team. You first talk about the core four on this as well. If it doesn't fit in to those, I think that's kind of your built in filter right there from what I'm hearing you say. Kent Clothier: Yes, sir. What else on this topic today, Kevin? Kevin Hommel: I think that's good, that's a couple of good nuggets for somebody out there. Kent Clothier: Very good. So thank you for helping me today, assisting me, joining us, hosting us today and again, that brings us to a good conclusion on discipline and calculating risk. Episode number 31 today and again, we want to thank you for joining us and remind you that ... send us an email, leave us some notes, give us some suggestions on anything you'd like us to talk about that we could help you with. And again, you can find this on memphisinvest.com. Scroll down and the Experience Matters podcast is on there, video and audio. Or Stitcher, iTunes and SoundCloud you could find us. Again, we thank you for joining us today. Have a great day, and it's our pleasure having you listening, helping you out with your journey. Thank you.